Juhl, a 344–residence, loft-style community that spans an entire city block in downtown Las Vegas and known for its flexible floor plans and industrial chic design aesthetic, announces a call to Nevada artists for its Artist in Residence program. This new initiative invites working Nevada artists to apply for the program which will provide an opportunity for select artists to live and work rent-free at Juhl in the heart of Downtown Las Vegas for a residency of up to six months. The residency includes a two-level live/work space at Juhl with a ground-level studio space of approximately 1,000 square feet and approximately 1,000 square feet of living space on the second floor. 1-Why do you want to be the Artist in Residence at Juhl? 2-What will you contribute or how will you influence the downtown Las Vegas arts scene? 3-What makes your work unique? 4-How would this residency help you complete a specific project or body of work that would further your career as an artist? A jury consisting of Uri Vaknin, Juhl owner and board member, Art Museum at Symphony Park; Justin Favela, Nevada artist and current Juhl Artist in Residence; and Michele Quinn, principal, MCQ, Michele Quinn Fine Art Advisory, and nationally recognized art consultant and curator; will select the next Juhl Artist in Residence from submitted applications by August 1, 2017. The selected artist will be offered a residency to begin October 1, 2017. Qualified artists must live in Nevada, have a demonstrated track record of success as an artist, have a desire to live and engage in the downtown Las Vegas arts community and enjoy the opportunity to champion art and culture in downtown Las Vegas by hosting regular arts-oriented events for the general public in their Juhl studio. Justin Favela, the program’s inaugural Artist in Residence, will conclude his residency this summer. He is a Las Vegas native working in the mediums of painting, sculpture, and performance and one of 30 Nevada artists whose work is featured in Tilting the Basin: Contemporary Art in Nevada in downtown Las Vegas that explores the full range of contemporary artists working throughout the state. 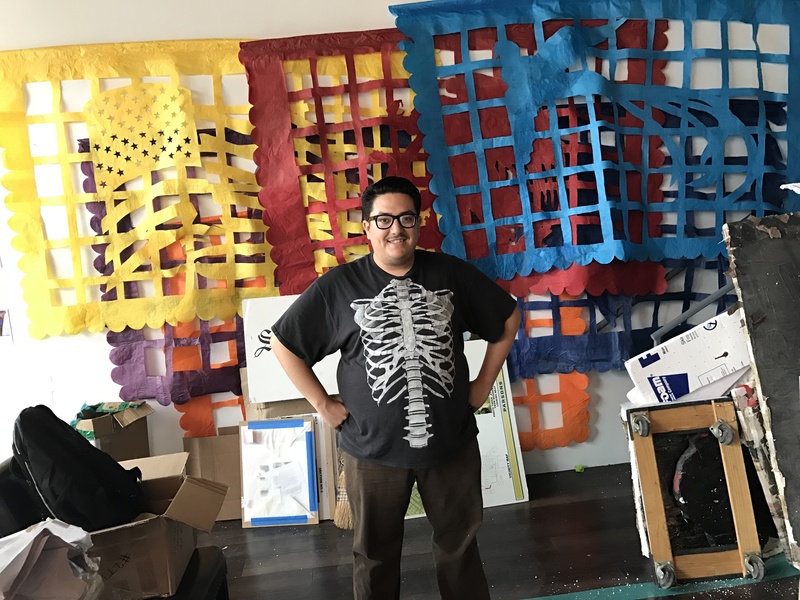 During his residency, Favela has been working on a commissioned piece for the upcoming Mi Tierra: Contemporary Artists Explore Place exhibit at Denver Art Museum. Favela is one of 12 other Latino artists from throughout the country to participate in this prestigious show, each expressing through their work the experience of living in the American West. Favela’s work draws inspiration from art history, pop culture and his Guatemalan/Mexican heritage. In addition to showing his work in galleries around Nevada, he has curated many shows throughout southern Nevada, from the University of Nevada in Las Vegas’ (UNLV) Marjorie Barrick Museum to El Porvenir Mini-Market in North Las Vegas. Juhl, now selling, is an urban destination, complete with 20,000-square-feet of specially curated ground level retail that complements the neighborhood’s existing retail, seamlessly connects downtown districts, including the Arts District, from which it draws significant inspiration. Juhl is a popular residential choice for professionals and entrepreneurs, especially many who work at firms and courthouses throughout downtown’s expansive legal community. Juhl encompasses multiple buildings, including a high-rise, mid-rise, brownstones, live/work spaces, retail spaces and a warehouse style loft building. Many of its residences can be customized via 130 unique floorplan configurations, including many that are one-of-a-kind within the property. Homes at Juhl range from 600 to just under 2,000 square feet and start in the high $100,000s. Recently refreshed, Juhl boasts an upgraded resort-style pool with cabanas, lobby and co-op working spaces that cater to its professional residents. Hallmarks of Juhl include flexible floor plans, large terraces and floor-to-ceiling windows that maximize natural light. Private balconies, 10-foot ceilings, energy efficient design and details, exposed concrete surfaces and mechanicals and upgraded fixtures and surfaces all combine to create Juhl’s cool urban vibe. Amenities include an al fresco screening room; two-story fitness facility overlooking the pool and spa; tenth floor wine patio, dining deck and fire pit; 24-hour security; gated parking structure with assigned resident parking; and full service concierge. A summer kitchen, called “Canvas Grill,” is the perfect spot for warm weather entertaining. And a nearby Urban Garden plot exclusively for use by Juhl residents makes it possible to grow fresh herbs and vegetables – in the heart of the city. To join the Juhl priority interest list register at www.juhllv.com.